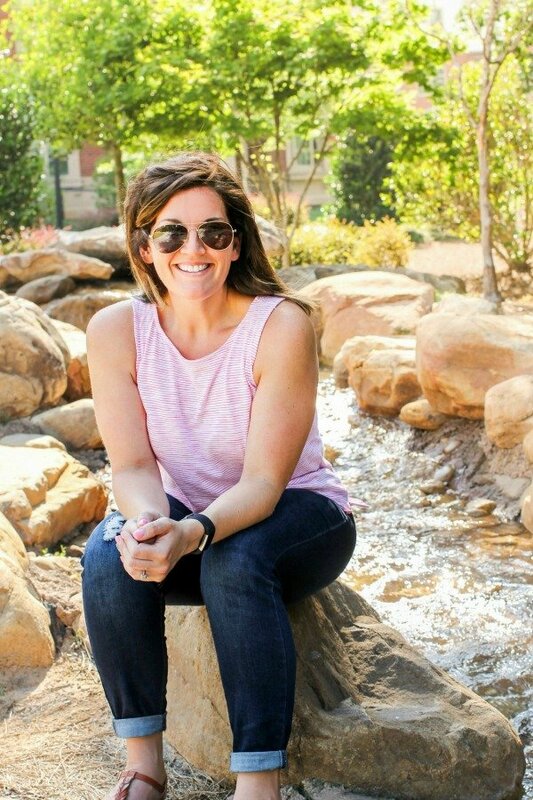 February 1, 2016 By Allyson 9 Comments This post may contain affiliate links. Read my disclosure policy. 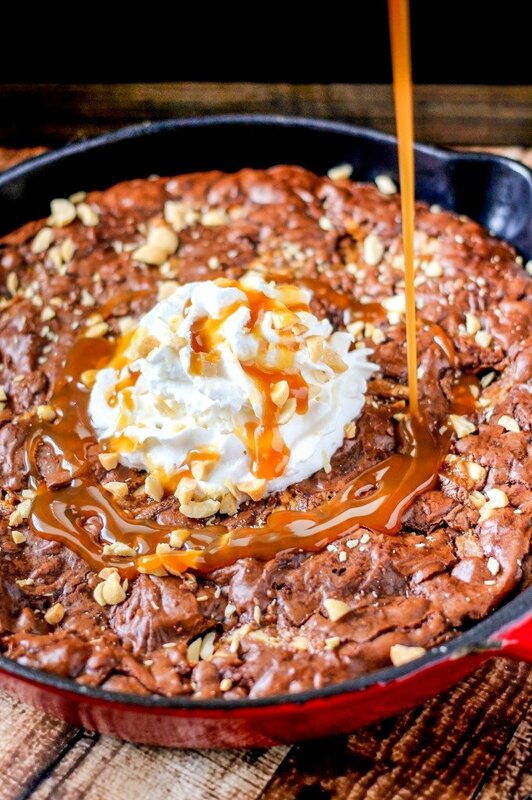 Snickers Skillet Brownies are ooey-gooey and full of chocolate, peanuts, and caramel. 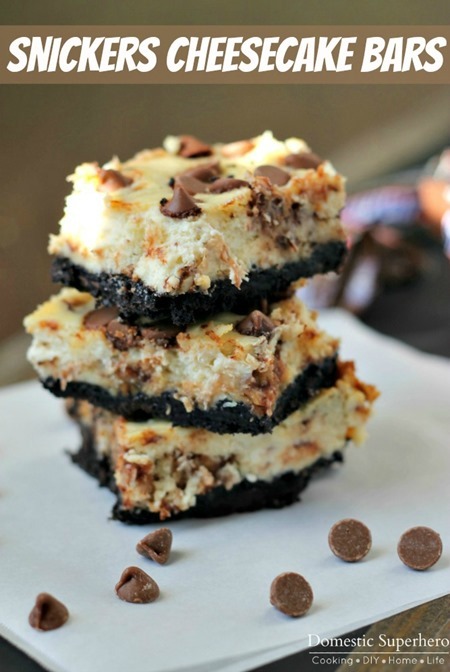 So easy to make and seriously delicious! Now that it’s February, it’s almost that time…the time for the BIG game! 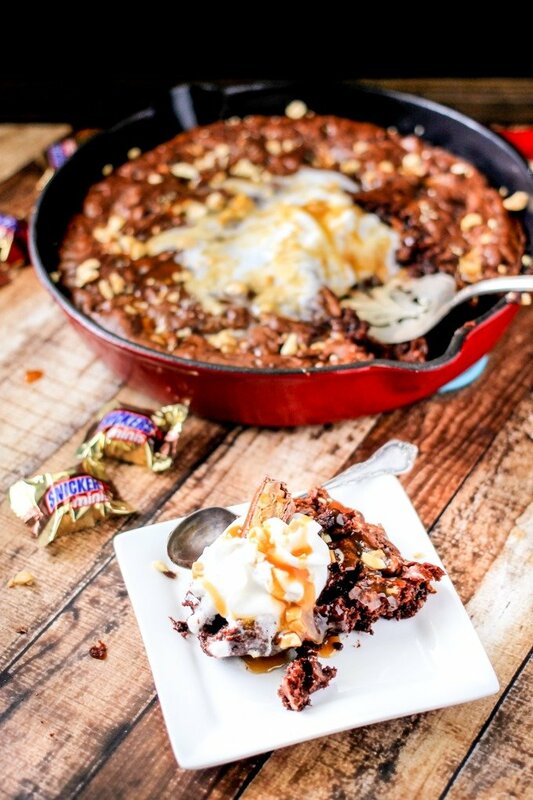 I have been thinking up fun recipes to make for the occasion, and when I thought up these Snickers Skillet Brownies, I knew I had to share them with y’all! This recipe turned out even better than I thought it would, and I can’t wait to share it with all my friends next weekend! 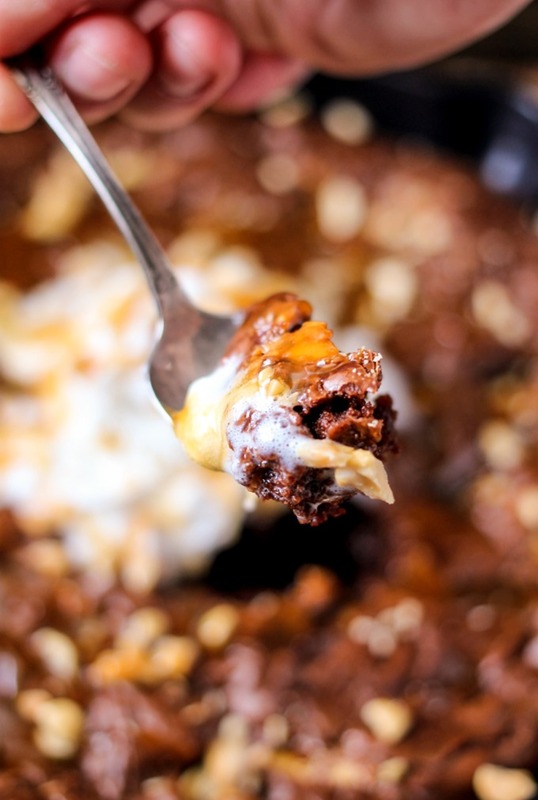 I started whipping up my Snikers Skillet Brownies. 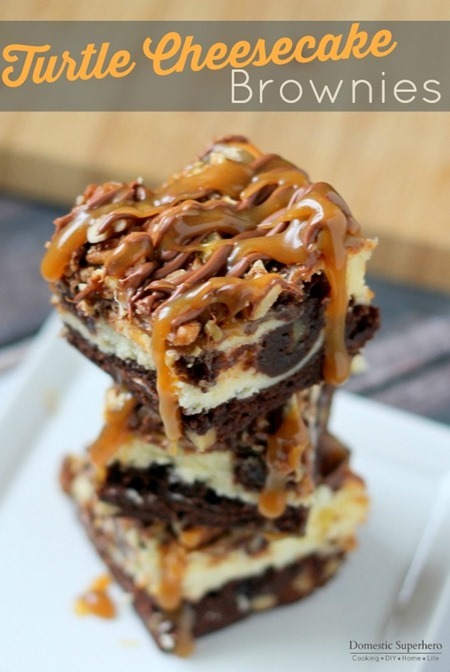 After chopping up the SNICKERS® Mini’s, I stirred them into the brownie batter. After spreading the batter into the skillet, I added a couple more chopped Mini’s to the top and lightly pressed them down into the batter. 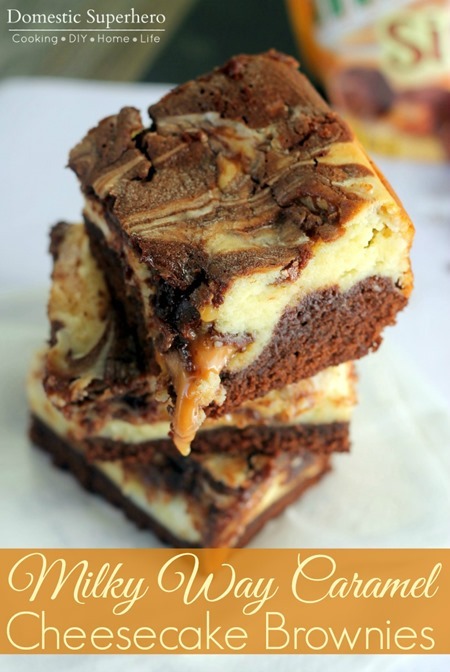 Don’t forget to add the whipped cream, caramel drizzle, and chopped peanuts!!! 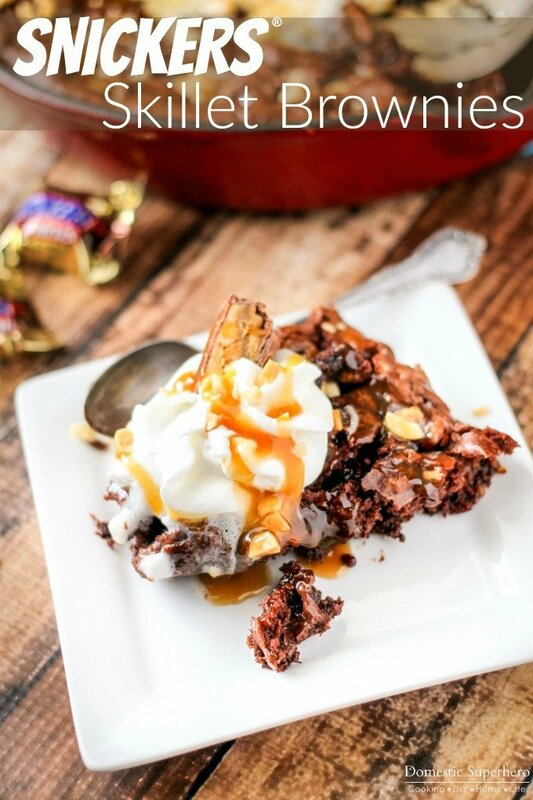 They totally complete these decadent Snickers Skillet brownies! Dig in!! Preheat oven to 350 degrees. Grease a 10 or 12 inch cast iron skillet. In a large bowl, combine melted butter, sugar, eggs, and vanilla. Mix until just combined. Add cocoa powder, flour, salt, and baking powder to bowl; mix to combine, but don’t over mix. 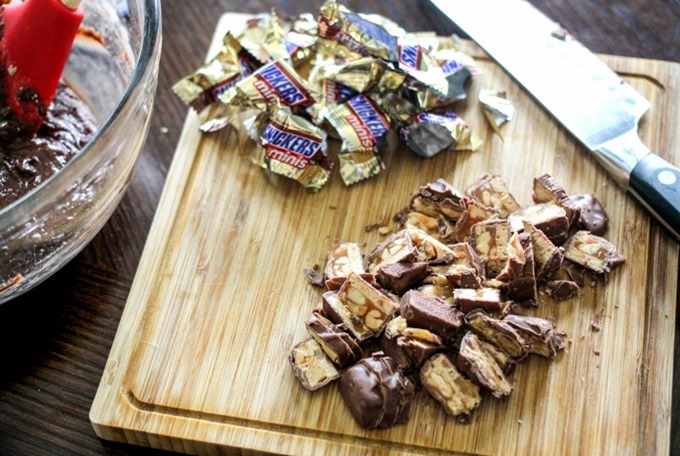 Add almost all the chopped SNICKERS®, leave about 2 TBS out (reserve for topping), to the batter, and fold to combine. Pour batter into skillet and spread evenly. Sprinkle remaining chopped SNICKERS® on the top of the batter. Place in oven and bake for 30-35 minutes. Check at 30 minutes with a toothpick and cook additional minutes if needed. Remove from oven. Top with caramel sauce, chopped peanuts, and whipped cream. Slice and serve.